Well this is interesting. 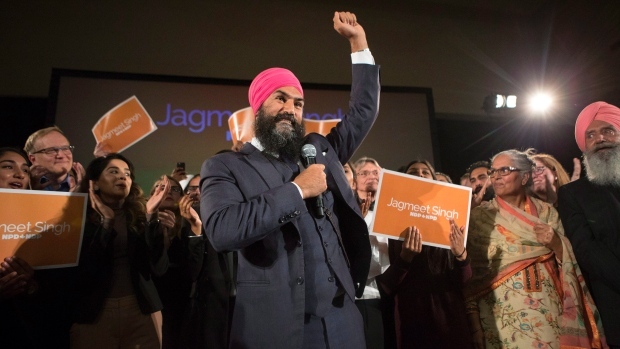 Rising star Jagmeet Singh won the leadership of the federal NDP on the first ballot. This is the guy who tactfully dealt with the racist heckler not by saying I'm not Muslim but by saying hate is wrong. CBC is reporting that "Jagmeet Singh is the next leader of the federal New Democratic Party of Canada, taking more than the 50 per cent of the votes in the party's federal leadership contest. In total 65,782 votes were cast, with Singh taking 35,266 on the first ballot. The Ontario provincial politician beat northern Ontario MP Charlie Angus who won 12,705 votes, Manitoba MP Niki Ashton who won 11,374 votes and Quebec MP Guy Caron who won 6,164 votes to claim the federal NDP's top job." Jagmeet received 35,000 votes and the next closest received 12,000. That is significant. CBC is also reporting that "When the membership sign-up deadline passed in mid-August, Singh's campaign quickly announced that they had signed-up more than 47,000 members, representing about 57 per cent of all new members signed-up in the course of the campaign and 38 per cent of the 124,000 members eligible to vote." New members and a new face. Let's see where this goes. I don't know much about him but I like his style. I'm not sure if I'm in 100% agreement with his Old Age Pension reforms but I do think he is a good person. That's hard to find in politics. what will really be important is if all those people he signed up stay the course and contribute to working in the next federal election and get out voting for the NDP. This guy is very dangerous. He said he has been carded 10 times, not 9 , not 11 but 10 exactly and yet doesnt lay a single complaint. He has also supported a terrorist. Go to wiki and search for Balwant Singh Rajoana. NDP justice critic, Jagmeet Singh, stood up in the Ontario legislature and suggested Ontario use its trade relations as a bargaining chip to save the backup suicide bomber. In his speech, the NDP Justice critic failed to tell his colleagues the man he was promoting was a convicted terrorist who had a hand in assassinating the equivalent of the Ontario Premier. Yes that part is a concern. Balwant rajoana killed a man named Beant Singh who was the equivalent of Slobodan Milosevic. Beant Singh was responsible for thousands upon thousands of young Sikh going missing. They were often tortured and killed. Their families would be told that their loved ones were killed attacking police who had no choice but to shoot. But their remains were almost always returned cremated to hide evidence of torture. That certainly puts things in a different context if true. I don't know much about the conflict at the time but I do recall seeing a video of an elderly Sikh man beaten and having his turban ripped off. There was no need for that. It was totally uncalled for. However, I think the concern is the 17 innocent people that died when they blew up Beant Singh and said they had no regrets. The public has a hard time accepting when innocent people are murdered in any politically motivated strike. Take Air India for example. We now know that CSIS provided the explosives for that heinous attack and had an asset on the ground that helped plan it. Yet there were others who went along with it. The world cannot accept when innocent people are targeted and murdered. That's just the way it is.